September 3, 2018 August 26, 2018 / Elizabeth T.
Oh my, can you believe that the summer is already almost over? Even though I’m super excited about the fall, I’m not quite ready to say goodbye to the summer just yet! There’s just something about late night talks under the summer stars and cotton candy sunsets that makes me want summer to last forever! As with every month’s end, here’s a little recap of some of my favorites for the month! Enjoy! First up is definitely this shampoo from Amika! If you’ve been following me for awhile now, then you’ll know that I got highlights in Taiwan a few months ago, and some of my hair was bleached and colored for a nice ashy blonde color. When I first got my hair done, it was honestly a little too vibrant and bright, so I wanted it to fade just a bit to blend in more naturally with my natural hair color. After a few months, I think it’s finally faded into a color that looks the most “natural,” so it just looks like I got a lot of sun in the summer! To keep this color fresh, I’ve finally turned to purple shampoo! If you don’t already know, purple shampoo helps blond hair from becoming brassy and essentially “cools” the tone. There are a lot of different purple shampoos on the market, but I really liked this Amika one because it not only does the job of keeping my hair tone cool and shiny, there are so many different proteins and vitamins in it to keep my hair strong and healthy! Another big plus – it smells so nice and really elevates my showering experience! Up next is another haircare favorite! For those of you who know me a little better, then you know your girl here is lazy when it comes to drying her hair hahaha! This is why I was so excited to get this hair cream from Bumble and Bumble, one of my favorite haircare brands. This hair cream is meant for air-dried styles, so it helps to enhance the natural texture of your hair while still keeping it soft and hydrated with its plant-based formula. I love how it’s so easy to use, and the results are amazing too! Of course, one of the biggest perks is how effortless it is! If there is one thing that I hate about the summer, it’s definitely how oily my skin gets due to the unbearable heat of LA! With excessive oil production, my pores are really more noticeable during the warmer months, which makes for more difficult makeup application. One of the products that has been helping me reduce the look of pores and improve my skin texture is the Ole Henriksen Cold Plunge Pore Mask. Not only does this cooling clay mask detoxify and control oils in the skin, it also helps skin look more matte in the long run! 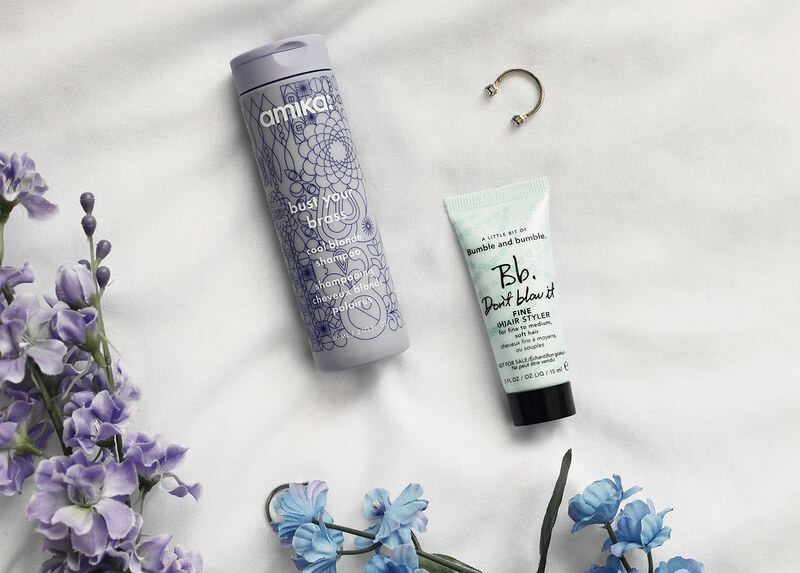 It’s definitely a skincare staple if you’re prone to oiler skin and larger pores in the summer! Plus, it’s super cooling once applied, so it’s definitely such a little treat to put on when it’s particularly hot outside! My next favorite is a makeup favorite, and it’s this concealer from Tarte! I’m not usually someone who wears concealers, but the years are definitely catching up with me! With a full-time job by day, and my blogging ventures at night, it’s safe to say that I haven’t really been sleeping as much as I should for the past three years. Even up until last year, this never really seemed to show on my face just yet, but lately, I’ve been noticing that my dark circles have gotten more and more severe. While I was on the hunt for a good concealer, I got this as a sample from Sephora, and I’ve been loving this concealer so much! The formula is definitely a lot more tacky than the creamy concealers that I’m used to, but I think that’s honestly what keeps it from creasing or emphasizing fine lines. I like wearing this over my BB cream for a more natural look. For a more airbrushed finish, I blend it in with a wet makeup sponge for a flawless look! 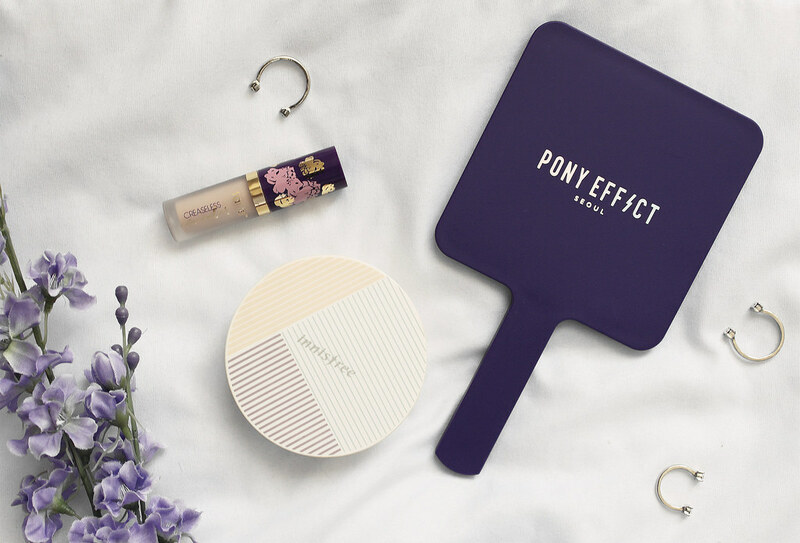 If you haven’t hopped onto the cushion foundation bandwagon, then you’re definitely missing out! 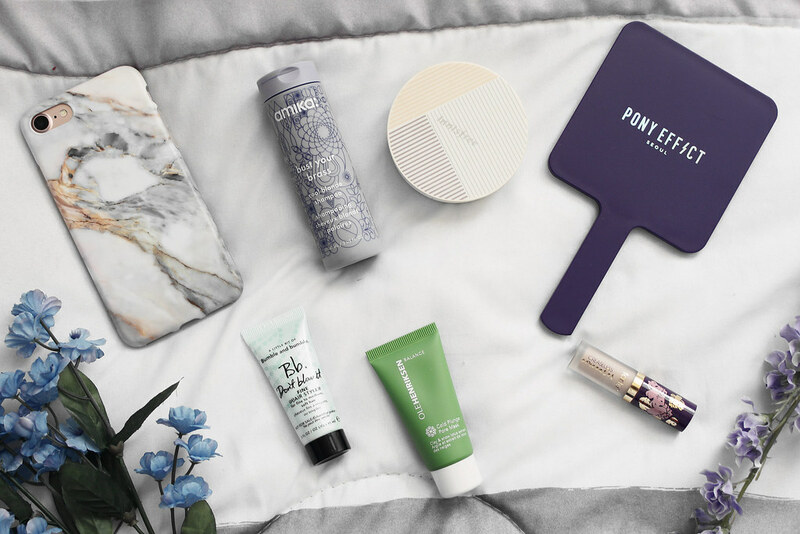 Not only are cushion foundations super convenient to take around, they’re also super easy to use! I generally just buy refills for my compacts, but I noticed that Innisfree released some new compact cases recently, and I just couldn’t resist them! All of the patterns are not only super cute, but also very affordable! If you want to switch up your compact every once in a while, this is definitely a very economical way to do so! Side note though – please make sure the size of your refill and the compact case that you’re buying is compatible, since there are different sizes. 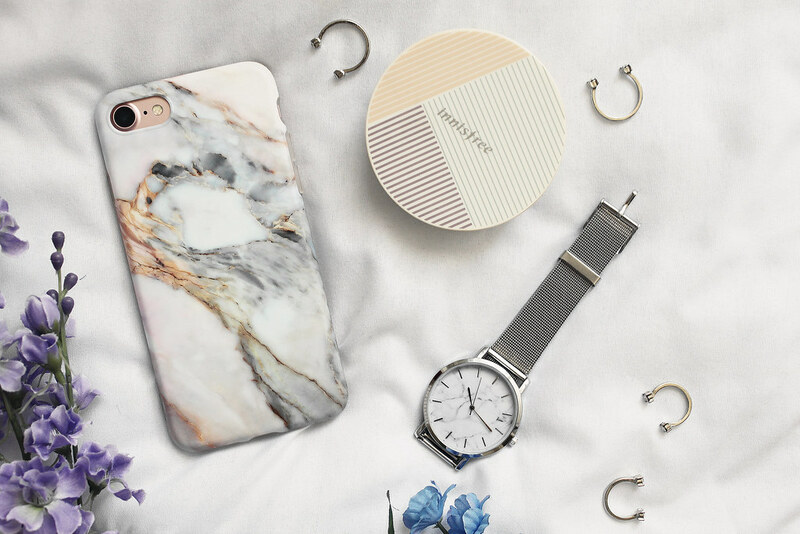 And my last favorite this month is this pink marble phone case from Imikoko! 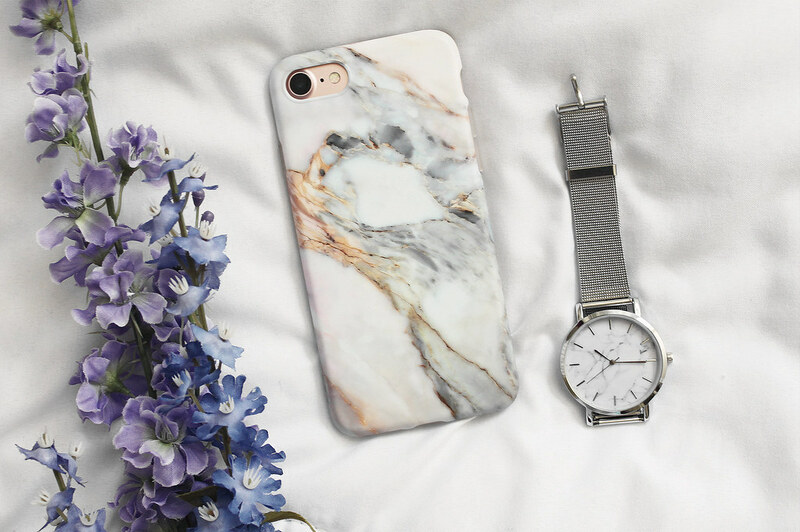 As many of you probably know, I’m a big fan of marble prints, especially when it’s for my tech, like my MacBook or my iPhone. From experience, hard cases crack really easily, so I always like to go for more flexible cases. I’ve purchased from Imikoko before, and what I love the most about there cases, other than the pretty patterns, are the shells because it’s kind of like a rubber case, but at the same time, it’s still got structured edges, so it protects the phone so well! A big plus – the oink marble printed pattern is also so pretty and unique, and unless you’re really analyzing it up close, you really can’t tell that it’s a printed pattern! And that wraps up my favorites for this month! What’re some of your August favorites? Let me know in the comments because I always love hearing from all of you!